After visiting the Roman Villa of Casale, we headed straight to our villa rental in Giarratana, Ragusa. It's called Il Sogno Villa, and it was great to have this home base for 4 days and 5 nights. (We stayed in Villa #1.) Our first day, we just hung around the villa and relaxed, but I started getting antsy, so we finally went for a drive. 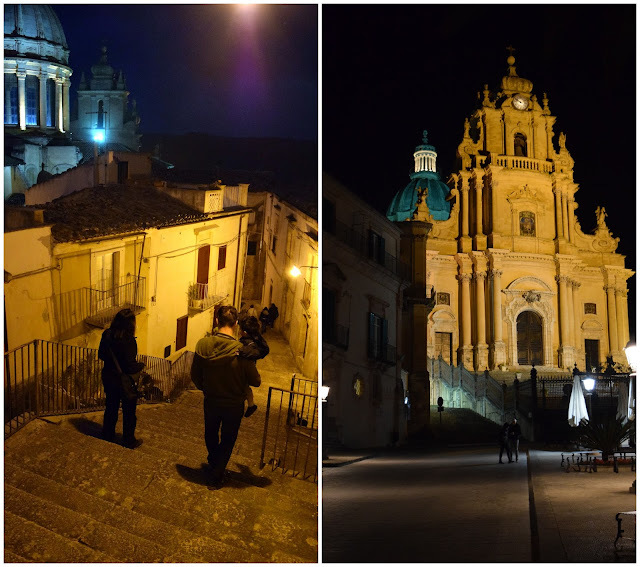 We headed into Ragusa Ibla, the historic part of the city. It was already dark, but we walked around the square near the main cathedral, then wandered around until we found some arancini for a quick, street-food dinner, and stopped for gelato afterward. I also found a great little gourmet shop and picked up some sweet pistachio spread and a couple wedges of local cheese (tuma persa and caciocavallo -- Ginevra's recommendations). We headed home on the windy roads, and crashed into our beds (well, after I lost my cookies 'er gelato. 12 weeks preggo + windy roads = no bueno). The next day we decided to take a day trip to Caltagirone after breakfast. This town is known for its ceramics, including a very long set of stairs lined with tiles. Sadly, the staircase has seen better days. We were a bit underwhelmed by this town. We had a nice lunch and purchased a lovely ceramic wall decoration (a hand-painted trinacria -- the symbol of Sicily -- with the head of Medusa surrounded by three running legs and three stalks of wheat), but otherwise, there wasn't much to see there as far as we could tell. The day after, however, was my favorite outing of our entire trip. We visited Modica, which is known for its chocolate production. Not only is the Baroque town lovely to visit, photograph, and just wander around, we ate the best meal here along with scrumptious gelato and artisanal chocolate. Addresses are listed at the end of the post, but let me just explain all this deliciousness. First, we ate lunch at Osteria dei Sapori Perduti. The food was traditional comfort food. I shared a bean dish with Hunter that he devoured. Isaiah enjoyed a pasta dish with lots of local ingredients, and my MIL had a yummy pasta-soup dish. The food wasn't fancy, just tasty, filling, and comforting. The place was packed with lots of people speaking in Sicilian dialect -- good sign -- and celebrating Easter Saturday. For chocolate, we tried Antica Dolceria Bonajuto. A word of caution: this place uses the traditional Aztec method of making chocolate, so the sugar crystals are not completely melted down and incorporated. You don't get that melt in your mouth feeling of chocolate we're used to, but I still thought it was delicious. So many flavors, and there are little dishes of samples so you can try before you buy. I really liked the vanilla flavor. We also bought and shared a cannolo from the chocolate shop -- so good. Above the chocolate shop lives this older woman who INSISTED that Isaiah and Hunter take a photo outside her garden, in this one particular spot, and there was no way we could not oblige her (it's the last photo before the next paragraph). For gelato, we stopped at Gelateria degli Angeli, and I had the "Modica Chocolate" flavor, of course! Give me all the chocolate! We also found the loveliest toy shop here: Il Giocattolaio di Pisana Giovanni. I wanted to buy all the wooden toys! On Easter Sunday, we grilled for lunch and we hid Easter eggs that I had dyed that morning for Hunter. He loved it, and it was fun to watch him squeal over each egg (and stop to eat each chocolate one). Later, I made a yummy Sicilian dinner (appetizer: caponata di melanzane -- eggplant stew -- and main: Sciusceddu -- meatball and egg drop soup) with lots of local ingredients . After dinner we relaxed and enjoyed our last night at the villa. Did I mention that we stayed up late every night watching CSI because it was in English??? 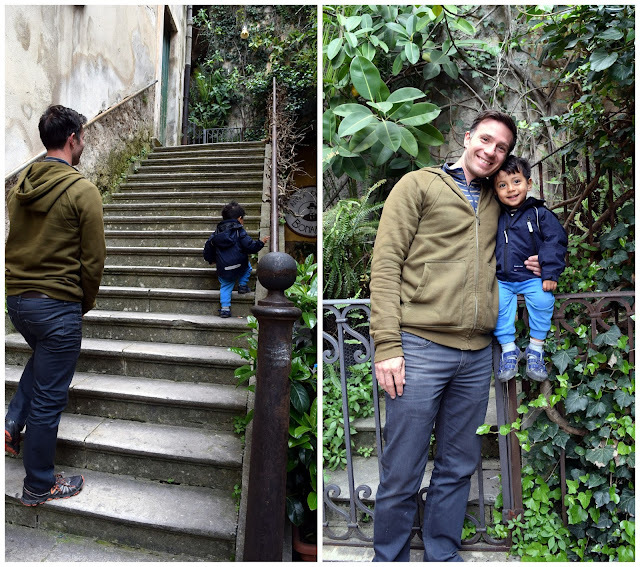 We headed out around 10 the next morning to make our way to Fiumefreddo di Sicila, which is not too far from Taormina and Catania. We stayed three nights at Il Giardino degli Ovali, which is owned and run by the nicest man called "Salvo" who tends orange groves. He greeted us with freshly squeezed orange juice and explained that the oranges are called "ovali" because they have an unusual egg shape. That evening was when our nightmare began. I won't delve into all the details, but the next few days involved Hunter and I staying behind at the orange groves while Isaiah visited his mom in the hospital. We walked around those orange trees A LOT and ate lots of oranges. We eventually moved to a hotel closer to the hospital. A couple of days before our flight back to the U.S., Isaiah dropped off Hunter and me in Catania so we could get out of the hotel and do something touristy. We rode the tourist train and picked up döner kebap for lunch. The next day, Isaiah drove us to Palermo where we stayed the night at Arianna's (that's one of her donkeys below) so we could catch our flight early the next morning. Our family trip had come to an end.